In iPhoto, create an album and put the pictures in it that you want to use in your DVD slideshow. 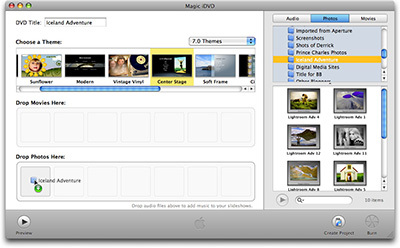 You can create several albums and put multiple slideshows on one DVD. Open iDVD and click on the Magic iDVD button. Choose your theme and type the title for your DVD in the title field. Go to the Media Browser, click on the Photos tab, and find the iPhoto albums that you want to include on the DVD. Drop the images from an album into an open Photo window in iDVD. This creates one slideshow. Repeat this process for each additional slideshow. 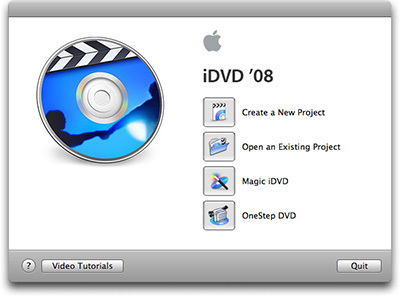 Click on the Burn button and insert a blank DVD. It's that easy. If you want to dress up your DVD or slideshow with music, custom transitions, and other goodies, just click on the Create Project button, then once you're finished with the enhancements, click on Burn. 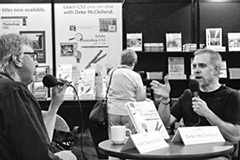 You can learn more iPhoto 08 tips by listening to my podcast, iPhoto 08. The first thing I noticed when I held the Canon PowerShot G9 was how compact it truly was. I hadn't owned a "G" series camera since the G2, and my, how things have changed. I was drawn back to Canon's top of the line compact series for a few reasons. First, the G9 supports Raw (.CR2) format. This is a deal breaker for me. No Raw, no dice. In my opinion, every shot I take has potential to end up in a magazine or book, and I have to be able to squeeze every ounce of quality from the image. So even my point and shoot needs to support Raw. The G9 wisely does so. Next, I very much like the control layout of the G9. The mode dial is on the top right and has all the usual options (P, AV, M, etc. ), plus C1, and C2. These are custom configurations that I can set, and they are a godsend. I have C1 set to Raw+Jpeg and C2 set to 16:9 Jpeg. I can switch entire configurations with just a twist of the dial. Wonderful. On the left top is the ISO dial, that's right, you get a knobby wheel for your ISO, and in the middle is a hotshoe with dedicated contacts. As the saying goes, you had me at C1. This is an amazing top deck. 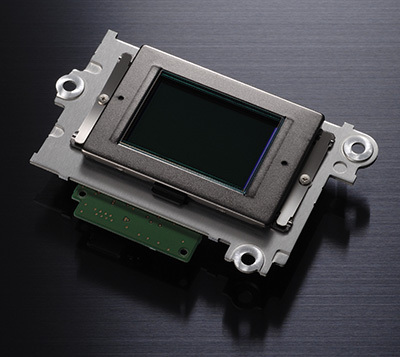 Inside the camera there is Face Technology, Optical Image Stabilization, FlexiZone AF focusing, customizable self-timer, and independent audio recording saving to .wav format. It's true, you can use the built-in sound recorder to capture at 44.100 kHz, 22.050 kHz, or 11.025 kHz. Quality is still limited by the microphone positioned on top of the camera, but this is a very handy addition to the camera that I've already used a number of times. And just a note about Face Technology, it really works. It's perfect for a compact camera that's often used for candids. Just compose the scene, and the technology finds the faces in it, sets the focus, and even adjusts the exposure, including flash. You have to try it to believe how well it works. I'm missing fewer shots as a result of this technology. On the back of the G9, you have an amazing LCD screen. At first I was disappointed that it didn't swivel like the one on my G2. But I discovered that it doesn't have to. You can hold it over your head or beneath your knees, and still see the picture. This is a serious LCD. Plus, it's a gigantic 3" in size. I added a transparent protection sheet to mine because it's so big I have a hard time not brushing it up against the abrasive world. Another notable feature on the back is the silver "image review" button positioned at the top right of the LCD. Any time you want to peek at the pictures on your memory card, just push the button. It doesn't matter if the camera is powered up or not, the review button works. This is a great convenience that I wish all cameras had. And What About Those Pictures? If you have the latest version of Adobe Camera Raw or Lightroom, you can process Canon's G9 .CR2 Raw files. My guess is that Apple will follow with support for Aperture, iPhoto, and Preview soon. 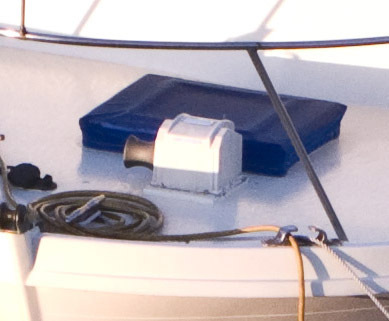 Below is a full frame image shot at ISO 100 in Raw, and then a 100 percent detail section from that image so you can examine noise and sharpness. The first thing you'll notice is that image noise is more apparent at ISO 100 that you're used to seeing from DSLR images. My feeling is that the 12 megapixel sensor that is smaller (1/1.7) than an APS sensor (found on Digital Rebels, 40Ds, etc.) is responsible for the noise (along with the accompanying electronics). At ISO 400, the noise increases more, and at 800 and 1600 it's too obtrusive for my tastes. Prints made from files captured between 80 and 400 look terrific. Detail, color balance, and dynamic range are excellent. I would have preferred less resolution, maybe 8 megapixels or 10, as a tradeoff for less noise, if that equation even applies. Either way, as long as I keep the ISO at 400 or less, I've been happy with the prints. Beyond 400, you're taking your chances. Each day I use the PowerShot G9, I like it more. I wish it had better noise control and 16:9 movies at high definition. But that's about it for the wish list. This camera is a joy to shoot with, is very customizable, renders both good movies and stills, and is beautiful to look at. The PowerShot G9 is not a substitute for a DSLR. But, in my opinion, it is a capable complement. When I walk out the door with the G9 in my pocket, I feel prepared to capture what the world throws my way. 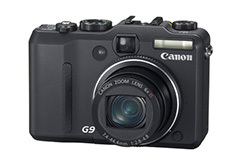 The PowerShot G9 is available for $476 US. And don't forget to spring for the LA-DC58H adapter that allows you to add conversion lenses and 58mm filters. It's only another $22. If you want more detail about the camera itself, here are the full specifications. 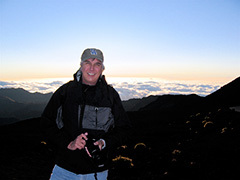 Want to learn new photography tips and tricks firsthand? This is your opportunity to discover shooting techniques that professionals have been using for years. Digital Photography Made Amazing is a four-hour exploration of how to make your camera record beautiful images just like those you see in magazines and books. If you can't make this Saturday's workshop, I've also created an Events Calendar so you can peek ahead, especially if you're planning a trip to Northern California. If you are around the Santa Rosa area this weekend, you can sign up online. 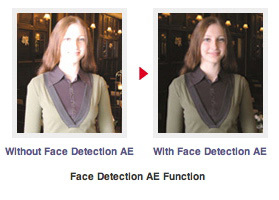 When Face Detection became the big buzz technology at PMA earlier this year, I, like many photographers, was skeptical. But I've been using the new Canon PowerShot G9 that includes Canon's latest version of this technology, and I'm impressed with how well it works for both focusing and exposure. I like it because when shooting people candids; it's faster than my previous method of focusing on a person, holding down the shutter button halfway to lock the exposure, then recomposing. That method worked, but I lost good shots because it took a few seconds to execute. Face Detection is quicker, and using it enabled me to get more into the flow of the shoot. What's really nice is that Face Detection also calculates exposure. 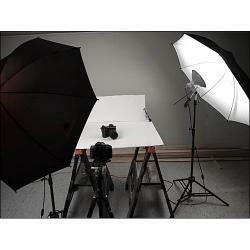 This is particularly helpful for flash shots of people in low light. Typically cameras would overexpose the subject unless you used flash exposure lock (again time consuming). 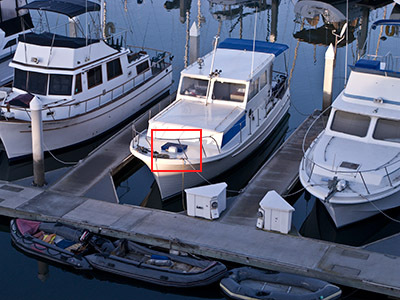 Face Detection knows what's most important in the scene and calculates the flash exposure accordingly. Along with good image stabilization, I'm now updating my recommendatlon to include Face Detection as a "must have" feature on your next compact camera. It's the real deal. "The high speed CompactFlash 300x cards allow UDMA-enabled D-SLR digital camera users to record more frames per second in continuous advance shooting mode and to transfer their images to the PC very rapidly to make room for new photographic projects. An 8GB CompactFlash card can hold up to 2,000 JPEG photos taken in 12 Megapixel resolution in the ‘Standard’ image setting, or up to 1,363 photos in ‘Fine’ mode. Even if both RAW and JPEG image data are recorded, the 8GB card offers enough space for more than 313 digital photos."